Automotive wire is found in every car, truck, and big rig on the road. We literally would not get anywhere without it. Because it's so vital to our everyday transportation, engineers are constantly improving the physical, electrical and chemical properties of automotive cable, to improve performance, reliability, and durability. Popular automotive wire and cable products include automotive primary wire, brake cable, starter, ground, and battery cable. These products are designed to perform in hazardous automotive environments; so many types of automotive wire and cable possess good fuel resistance, heat resistance, and abrasion resistance, a high flex life, and a lightweight construction. 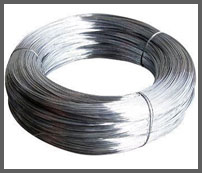 General Introduction: Galvanized steel wire is made of carbon steel zinc plated. The zinc coating offers corrosion resistance, allowing vary varied use for weaving of galvanized wire mesh, galvanized hardware cloth, welded iron wire mesh, chicken netting, etc. The Zinc coated galvanized wires are highly resistant to Moisture and mechanical damage which prevents it from rusting, and have a very bright and smooth surface finish. Wires for Ropes are cold drawn wires made from unalloyed high carbon steel. 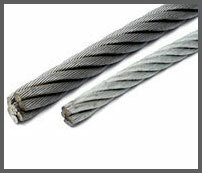 These wires find application in construction, mining, shipping and various other heavy industries. We can supply wires in four grades of steel wires to specific customer requirement within the specifications . 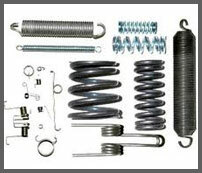 Uses :- Cold formed helical springs, spring rings and wire forms. Packing :- The wires are supplied in weight of 10-250 kgs., depending on size of wire. The coils are oiled and packed with polythene and Hessian. Diameter :- Range 0.20 mm to 8.0 mm**. Packing :- The wire coils are supplied in weight of 10-250 kgs., depending on size of wire. 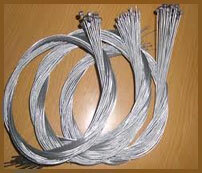 Spring Steel Wires are normally oiled and packed with polythene and Hessian.